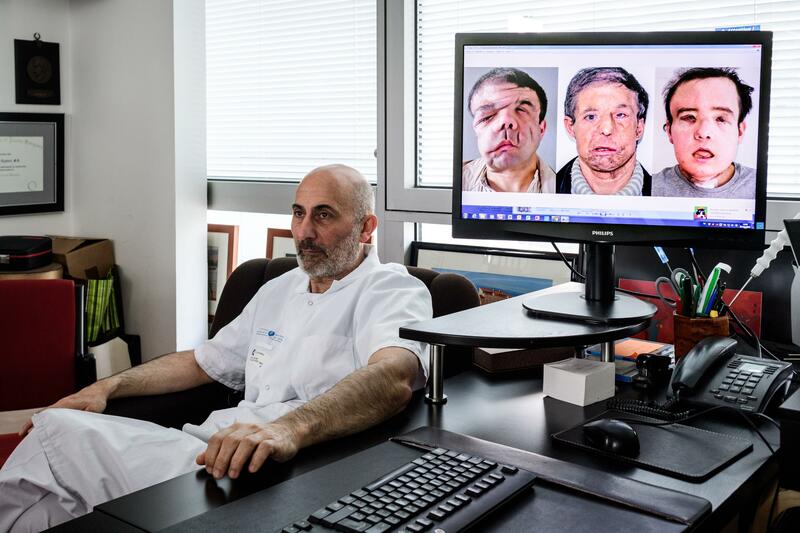 LONDON — In a medical first, a French surgeon says he has performed a second face transplant on the same patient. The man is now said to be doing well and even spent a recent weekend in Brittany. Dr. Laurent Lantieri of the Georges Pompidou hospital in Paris first transplanted a new face onto Jerome Hamon in 2010, when Hamon was in his mid-30s. BBC News reports Hamon suffers from neurofibromatosis type 1, a genetic condition that caused severe disfiguring tumors on his face. The first transplant initially was a success. But after getting ill in 2015, Hamon was given medication that interfered with the anti-rejection medicines he was taking for his face transplant. Last November, the tissue in his transplanted face began to die, and Lantieri had to remove it. That left Hamon without a face, a condition that Lantieri described as "the walking dead." Hamon had no eyelids, no ears, no skin and could not speak or eat. He had limited hearing and could express himself only by turning his head slightly, in addition to writing a little. "If you have no skin, you have infections," Lantieri told The Associated Press on Tuesday. "We were very concerned about the possibility of a new rejection." "For a man who went through all this, which is like going through a nuclear war, he's doing fine," Lantieri said. He added that Hamon -- who has been dubbed the "man with three faces" -- is now being monitored like any other face transplant patient. Hamon's first face was donated by a 60-year-old. With his second transplanted face, Hamon said he managed to drop a few decades. "I'm 43. The donor was 22. So I've become 20 years younger," Hamon joked on French television Tuesday. "If I hadn't accepted this new face it would have been terrible. It's a question of identity... But here we are, it's good, it's me," he told AFP news agency. Other doctors applauded the French team's efforts and said the techniques could be used to help critically ill patients with few options. "The fact that Professor Lantieri was able to save this patient gives us hope that other patients can have a backup surgery if necessary," said Dr. Frank Papay, of the Cleveland Clinic. He said the techniques being developed by Lantieri and others could help doctors achieve what he called "the holy grail" of transplant medicine: how to allow patients to tolerate tissue transplants from others. "The more we see what's happening with (face transplant) patients, the more we have to accept that chronic rejection is a reality," Pomahac said. "Face transplants will become essentially non-functional, distorted and that may be a good time to consider re-transplanting." He said it's still unknown how long face transplants might last, but guessed they might be similar to kidneys, which generally last about 10 to 15 years. "Maybe some patients will get lucky and their faces will last longer. But it will probably be more common that some will have to be replaced," he said, noting there are still many unknowns about when chronic rejection might occur. "The other patients I'm following, some have had some alteration of their transplant over time, but they are doing fine," he said. "I hope not to do any future transplants like this." The first face transplant was performed in France in 2005 on a woman named Isabelle Dinoire, who died in 2016 after developing cancer. There have been some 40 face transplant operations around the world since 2005.